This year’s Dancescape Night is all new: we’ve changed the venue, added live performances, and have a whole new crop of amazing prizes to give away! PINK TACO is located in the Westfield Shopping Plaza in Century City on the second floor. And then, of course, there are the raffle prizes. . .
*These tickets will be part of a separate, ongoing raffle with the winner drawn at Dancescape Night. As of August 2011, our parent company, Cheshire Moon Inc., is a officially a 501c3 non-profit organization. This was a huge step in our goals to create even more performance and educational opportunities for up and coming dancers and dance professionals, as well as to fund a greater amount f art and music programs in Los Angeles public schools. Dancescape Night is an opportunity for us to reach out to the community, showcase the amazing people we work with, and raise funds for the production of future Dancescape performances and grants. Want to know what DANCESCAPE is all about? Join us for a night of performances, prizes, dining and dancing that will support art & music programs in our schools. from 7 – 10 pm. Feel free to bring your toughest drink orders to keep them “on their toes”! Click here to RSVP through EventBrite! 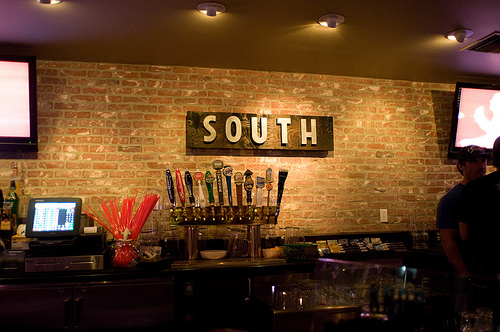 South is located at 3003 Wilshire Blvd. 21+ unless accompanied by a parent or guardian. I’m looking for a good place to start training in New York for adults. I haven’t dance in four years. I’m over 25. Would you recommend me a good one at a not too high price? Perhaps scholarship or work/study program. Definitely go to Steps on Broadway! Classes in all styles, good for any level. Great, descriptive website and the people at the front desk will be very helpful in guiding you to select the appropriate class for what you want. Happy Dancing!